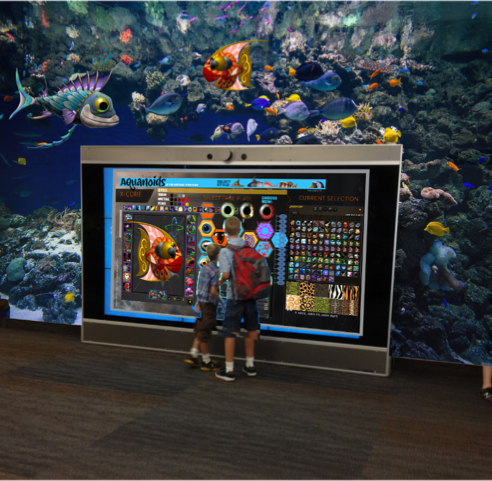 The Virtual FishTank at the Museum of Science, Boston is an immersive learning and play experience created in 1996 with a grant from the National Science Foundation by a team of brilliant minds from the MIT Media Lab. Year after year it remains one of the most popular and engaging exhibits at the museum. Now, Static-Free Media announces Aquanoids & the Virtual FishTank, a rich new state-of-the-art franchise that brings the experience to mobile web and beyond. The world of Aquanoids & the Virtual FishTank is actually alive with characters, stories and lots of ways for kids to be part of the action. We’re building a next-generation entertainment franchise powered by patented technology and designed for success in today’s multimedia marketplace with integrated consumer products, video, games and more. Aquanoids & the Virtual FishTank is Static-Free Media production.